I've always worked. Ever since I was a kid I've done some sort of gig to earn money. From babysitting, delivering the Chicago Tribune at the crack of dawn, mowing lawns, making pizzas at the high school cafeteria, to delivering the Daily Breeze I did whatever it took to make a buck. It wasn't until 1988 that I got my first break in what I was hoping to be my calling: the computer game entertainment industry. My high school teacher knew me to be a gamer and had a friend of his who was starting a business and was releasing a computer game. They needed some volunteer testing on it and was wondering if I'd be interested. I jumped at the opportunity. I signed the NDA papers, played the game, found a few bugs and did what I could in the time provided. That summer, they offered me a job working tech support. They needed someone to enter in the registration cards that people mailed in and answer phones. Since I knew the game, I'd be perfect. I jumped at the opportunity, making $6 an hour, which was good money back then. I was studying computer science in college and I definitely wanted to get into the entertainment industry. This could certainly be my ticket in to the exclusive computer entertainment industry. This company was Mindcraft Software, located in Torrance, California. If you Google around, you'll probably notice they are out of business. They had a fantastic run but had a lot of bad breaks along the way. It was also a gaming company that had a HUGE potential, as their first game was a monster hit as well as several of their subsequent releases. I worked on their Magic Candle Series (I was the dude who put together Magic Candle II's dungeons) and did quite a bit of work on their other games. During the summers and holidays I worked full time and when I didn't have classes at California State University Long Beach I'd show up. I went to CES before CES was all about electronic gadgets. I talked and dealt with the press who would wind up reviewing our games. I answered phone calls all day long with people looking for hints or having problems with our games. I also did all the bulk mail... sending out 10's of thousands of pamphlets and flyers. The company started with just its founders and family and a few tech support people. But as the years went by we grew. Soon we had half a dozen developers, full-time artists, and tech support doubled and eventually tripled. There was no "process", no "agile" here. Everything was ad-hoc and it was truly fun. New code was passed around via a floppy disk and hand merged. Emails didn't exist. LANS / Networks? No such thing. Defects / bugs were written on script of paper and thrown in a box and delivered to the developers at the end of the day. Sometimes they'd be fixed, other times not. Code was changed up to the last second with no testing done on it. Without a process we often had very buggy software -- and this was before you could just put a fix on the internet and have people download it. We had to mail them out -- hundreds of them, if not thousands. In fact, entire days of mine were spent making upgrades (by manually copying them onto a disk) and preparing shipping and running to the post office. Each of their games had a major problem. Eventually we did run a BBS system to help but not everyone had a modem and not everyone was willing to make a 20-minute long-distance call to download a fix. I suspect Mindcraft could've survived the buggy software, even though our reputation was suffering, but to make matters worse we had what appeared to be unscrupulous distributors. One pretty much walked away with the lion's share of profits from the first two games (which were wildly successful). I believe there was a disagreement over returns with the second distributor. The third distributor -- who still exists today - was flawless but they demanded that games be delivered on-time, otherwise there was monetary fines,so that compounded the buggy / rushed releases. As a result of the defects, we had a LOT of returns -- mountains of them. I think that ultimately sank the company. I distinctly remember we had to rent a special warehouse so that we could store all the returned games. Boxes piled high from floor to ceiling with returned games. All saying pretty much the same thing: the game wouldn't install. To make matter worse, because of the installation defect, people would think it was just bad floppies and go back to the store and get a new one. So often the same customer would buy 2 or 3 (or more) copies. I'd open the boxes, salvage the parts that weren't bent or obviously used and pitch the rest. Again, 1000s of copies of games were sent to the dumpster.... and I'd spend weeks processing them. It was truly heart breaking. The installation defect worked like this: you'd put in disk 1, type install and it would install disk 1. At that point, it would request disk 2. You'd insert disk 2 and then it would ask for disk 1 without installing disk 2. This would go on in an infinite loop. We could never reproduce it in the office, until one day I while I was reviewing the code I discovered that the configuration file on disk 1 was opened and NEVER closed. So the DOS OS complained about it and by inserting disk 1, the program was hoping to close the file, which never happened. Delete the config file on disk 1 and it would work fine (or fixing the installation program to close the file). Again, 1000s of games were returned because of a configuration file that wasn't closed on disk 1. Each one dinging the company whatever it took to make the game plus shipping. In addition to processing returns, all throughout college I answered phones, did the occasional tool in Pascal, and took care of the BBS. I was going to be made a programmer once I graduated from college. And sure enough once I did I was put in the driver's seat of an upcoming game. I was given some simple tasks to do. I hadn't been a big fan of C programming. My initial forays had been corrupted memory and I even wiped out the FAT table of a hard drive. I probably had the talent to be put there earlier but I think there was some prejudice in assuming I didn't know what I was doing because I had started as a rookie. Sadly, about a month or two after I graduated I was laid off. The company's reputation had suffered and a number of the latter games turned out to be poor sellers. The company had about 20 employees at the time and I remember it being a very emotional time. I was in the first wave to be let go and in a matter of months the rest of the group would be shown the door too. I was one of the few that didn't have a family or rent to pay so I was the most expendable. I was only making about $10/hour at the time though -- good money for someone living at home with his parents. Not only had I been working there for a long time, but many of the employees were like family to me. I had met or spoken with many people in the industry who would go onto bigger and better things (Blizzard Entertainment was just a blip on the radar back then). I worked closely with the creator of Everquest for a while. Many of the workers there are still in the industry producing games, while others slipped off into the horizon. I'll always be grateful for the opportunity there. It kick started my career and very likely I'd be pontificating English literature (that was going to be my fallback career -- an English Literature major). It also gave me an "in" into the gaming industry. Occasionally I still get a feeler from a recruiter wanting to know if I'd want to get back into it, but so far, I've been K-12 education focused. 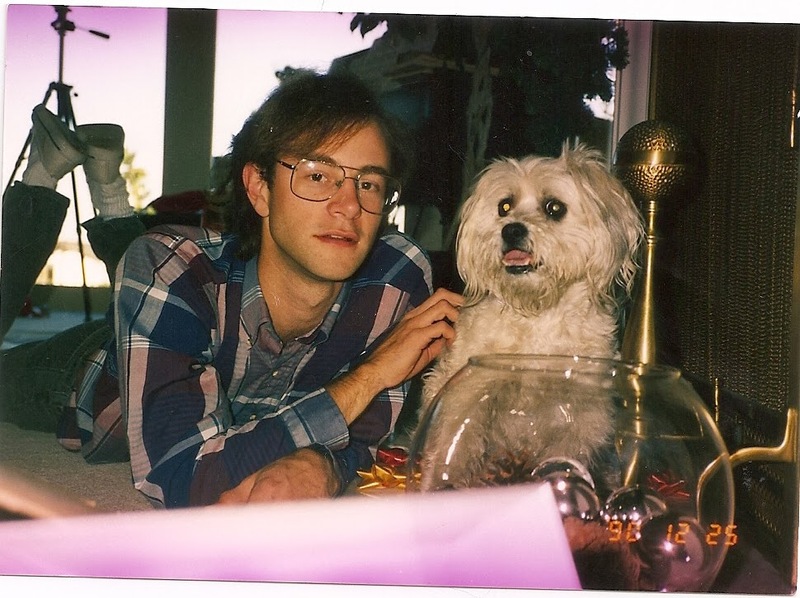 Me, 1990 with my dog Taffy. Not work related, but that's me.